Tarragon and Chevre Omelet, Thyme for Cooking first course. 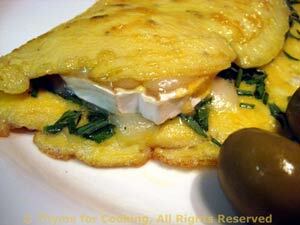 This is a first course omelet - 2 eggs, some fresh herbs and a bit of cheese. For a light lunch or supper use 3 eggs, a bit more cheese, maybe some ham or tuna and serve with a salad or some crusty bread. Use a proper, aged goat cheese: log-shaped (long, round) with a thin rind that is an edible part of the cheese. Thinly slice (1/4" thick, .65cm) or crumble goat cheese. With scissors snip herbs, divide in 2 and set aside. Add half of the butter. When melted add eggs and swirl around to cover bottom of pan. Sprinkle with half of the herbs (and a little salt and pepper if you like). When the eggs are almost set lay goat cheese rounds on 1/2 of omelet and with a spatula turn other half on top. Leave in the pan another 20 - 30 seconds to finish cooking and remove to plate. Serve, garnished with a few olives.